I traveled to Yakutsk in Far-East Siberia in 1992 & 1995 in order to establish a satellite receiving station in a region where we could capture satellite imagery of the Siberian Boreal forests. After EOS Terra was launched in 1999 the data were no longer needed, but the system continues to provide weather data for the Russian weather services. Most of theses pictures are from 1992, when I traveled to Khbarovsk, Yakutsk and Krasnoyarsk as a part of site studies and negotiations with Russian authorities. I start with shots of the exotic landscape near my hotel and in the city, where buildings gradually sink into the ground as they melt away the permafrost. Unlike most of the former Soviet Union, there are many single family homes, and much that is neither Czarist nor Communist in its origin. These are buildings of ordinary people! My Russian hosts were from the weather service (ROSHYDROMET) and the Russian Academy of Sciences. Among other things, they treated us to an all-day cruise up the Lena River, visits to the museums and markets, meetings with fellow scientists, and wonderful times at the home of my then-future friend, Yevgeny Durnov. Along the way my traveling companion, Ed Rich, and I fell in with some Chinese businessmen and witnessed a cross-cultural drinking fest. (The Chinese won!) There are a few pictures from 1995 when we came back to install the receiving station. The back story of how this all came about is a long and complicated one. I will simply note that it took 4 years to accomplish what should have taken 18 months. Witout the aid of my Russian friends, Mikhail Antonovsky, Akexandr Isaev, and Kirill Kondratyev, it would not have been possible. And through this venture I gained the friendships with Mikhail Antonovsky, Akexandr Isaev, and Yevgeny Durnov. 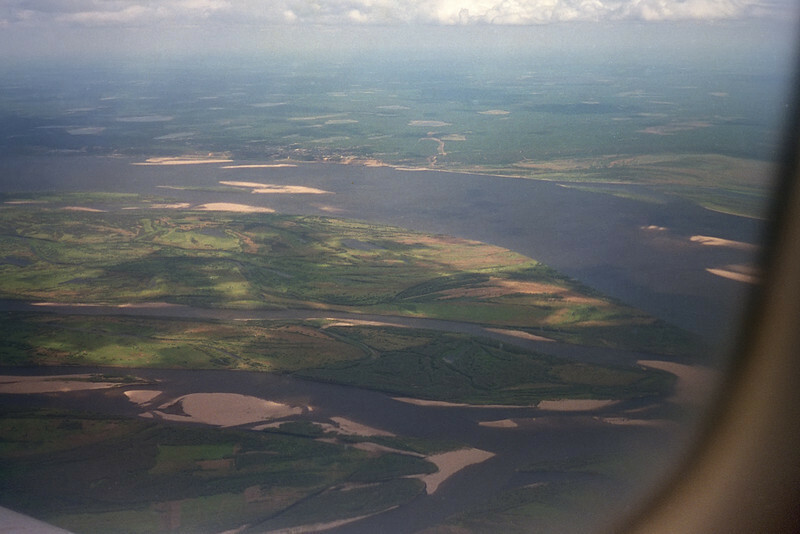 The Lena River (Река Лена) and its extensive wetlands just north of Yakutsk (Якутск), the capital city of Yakutia, the Saha Republic (Республика Саха) of Russia.